Imagine if you could accurately predict today what New Zealand’s climate would look like in 2150. This is ultimately the aim for the Deep South National Science Challenge. A group of New Zealand researchers is contributing, in an international partnership led by the UK Met Office, to the development of a new Earth System Model (ESM) that will provide policy makers and economic stakeholders with the information they need to prepare for and respond to changing climate. As extreme weather events become more frequent, flooding risks increase, and ski seasons get shorter, this and similar other models will help New Zealand communities continue to thrive in the face of climate change effects. NeSI resources are providing a portion of the computing power, and NIWA experts are helping to advise on some aspects of the design of the ESM. Typically, ESMs contain many components (atmosphere, ocean, land, vegetation, etc. ), each running on its own grid. When working with these models, it is imperative to be able to move data quickly and seamlessly across grids without introducing inaccuracies. This process of projecting data from one grid onto another is called regridding. Regridding is becoming an increasingly important aspect of climate and weather forecasting simulations as the models move away from latitude-longitude grids, the hitherto standard for locating any position on the surface of the earth. Climate modellers have found latitude-longitude based grids inadequate near the North and South Poles, regions of high interest, because many numerical algorithms have issues when the coordinates collapse to a singular point. Curvilinear grids such as Fig. 1 are commonly used for ESMs to alleviate the problem of singular points. However these present their own set of challenges for regridding tools. On the one hand, it can be difficult to locate a source grid cell given a target point when grid lines are highly curved. On the other hand, earth science data tend to be attached to grid cells, and cell-centred data don’t associate values with specific points. Instead, cell-centred data represent the average field value over cells. 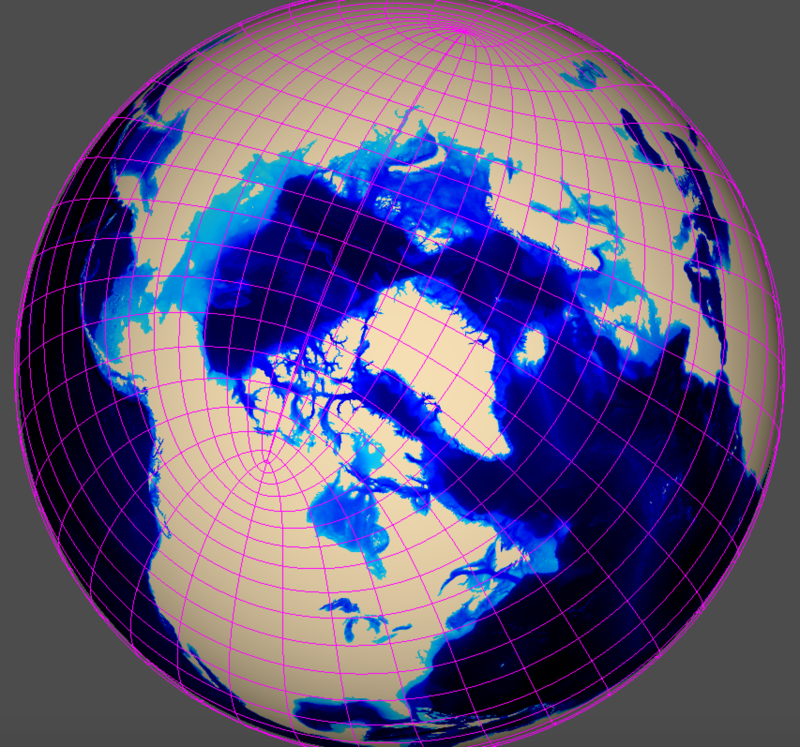 Figure 1: The tripolar grid used by the NEMO ocean model replaces the North Pole singularity with two poles located on land (Canada and Siberia). So curvilinear grids require conservative interpolation, which involves computing the overlap of target grid cells with source grid cells. 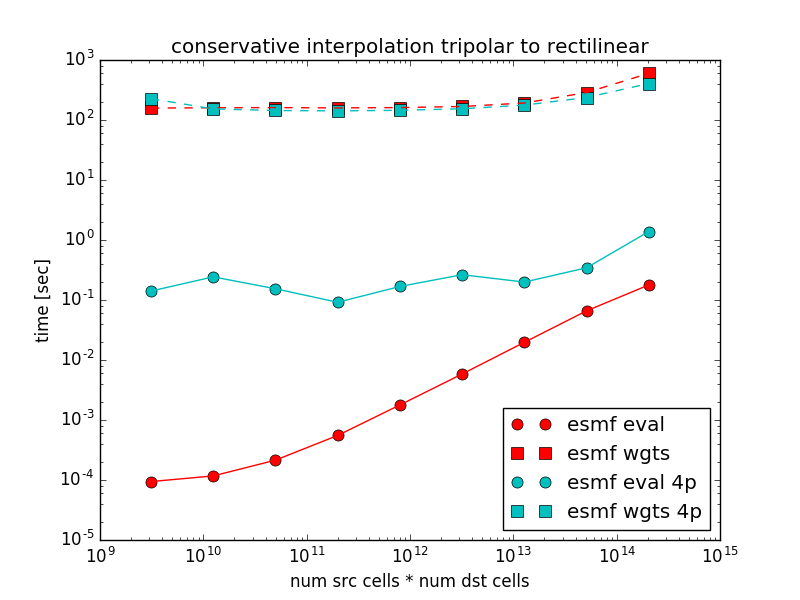 To compute the interpolation weights, one needs to compute the collisions of N source grid cells with M target cells, an N*M problem. When N and M are of the order of millions of cells, the winning regridding tools are the ones that can compute the interpolation weights in less time. This is where NeSI’s expertise has helped. Olaf Morgenstern, who is leading model development for the Deep South National Science Challenge, and Jamie Kettleborough from the UK Met Office, consulted with Alex Pletzer and Chris Scott from NeSI’s Computational Science Team to evaluate different regridding tools in terms of capability, accuracy and performance. Of the tools evaluated, NeSI found the Earth System Modeling Framework (ESMF) had all the features required to regrid present and future data most effectively across a variety of curvilinear grids. Figure 2: Execution times for computing interpolation weights and applying weights to the source grid field as sizes of the source and target grids increase (ESMF conservative). Computing the weights takes 1000 times longer than the evaluation step. Since other earth science researchers could benefit from these findings, NeSI plans to share them more widely. One of the first places will be Iris, an open-source Python library created by the UK Met Office to enable the visualisation of weather and climate data. As for the Deep South Challenge, NeSI will continue to support this and other projects funded under the Challenge’s Earth System Modelling and Prediction Programme. For more information on these and other Deep South Challenge news and events, visit The Deep South website.